Perhaps it’s the February rain that fell on our roof, or the grass I see taking over for the snow. Signs that spring really is just around the corner, and closer than it maybe should be for March. Before there were four of us, there were two and we wandered almost as much then, as we do now with our girls. The two of us discovered and ate at our very first pizza farm over 12 years ago. Our first pizza farm experience came about from word of mouth. We had not read about it anywhere and had to do some serious digging to find information about the place. Since that day 12 years ago, there seems to be a few more opening up each summer. We have now been to five different pizza farms since that first visit. 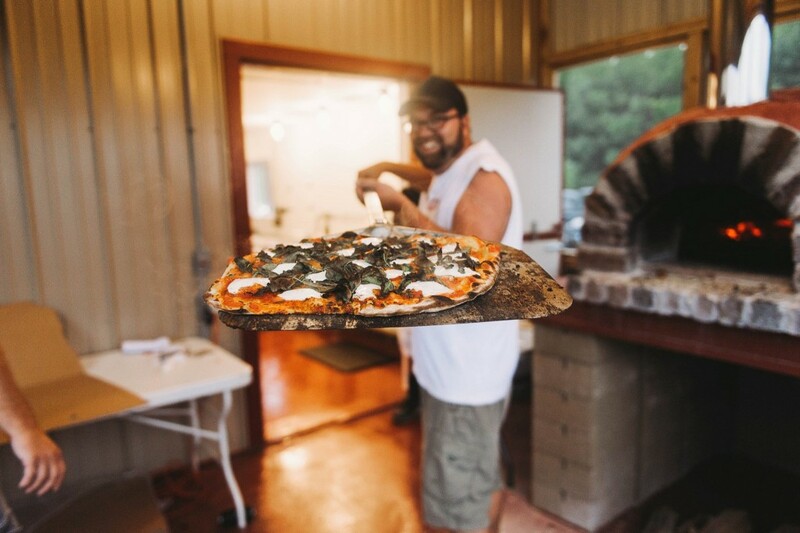 An important thing to realize and know about pizza farms is that they strive to grow most of their own ingredients on the farm, or to get it locally. They are usually small, and are open on a varied schedule. Each farm has their own schedule for when they choose to have pizza nights, or even on specific afternoons for some. Our first pizza farm experience 12 years ago, was at a hidden gem called A to Z Produce and Bakery. It’s located on a quiet little gravel road just outside Stockholm WI. At that time there were no big signs to mark the way, so we really questioned where we were going the first day we went. This particular farm is open on Tuesday evenings. Their website does not have an opening date yet for 2016, but last year they opened in March. Out of all our experiences this one had the thickest pizza, but it also had a bit longer cooking time from when it went into the oven – very much worth the wait though as it was delicious. Photo from A to Z Produce and Bakery Website. 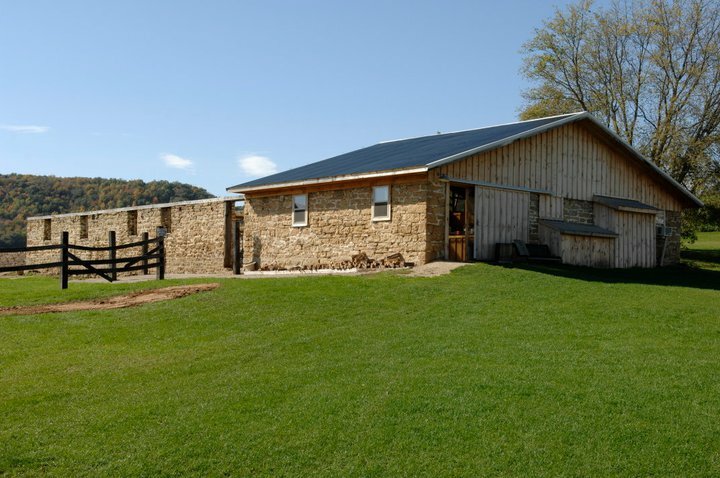 Our second pizza farm experience was at The Stone Barn, which is located just outside the quaint town of Nelson WI. Out of all of our experiences this one is most like a restaurant. 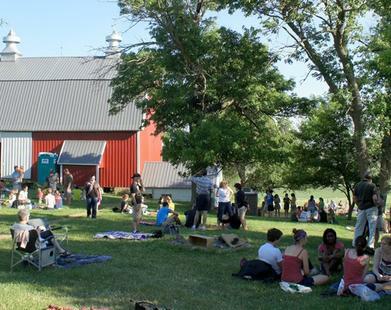 It is located on a farm and, like the rest, is not open all the time, but it has more regular hours and seating is mostly indoors, in the barn itself. You don’t need to bring much to this one as they have plates etc. They even offer drinks and ice cream for purchase. Their website currently says: “Our 2016 season begins Friday, May 20 and goes through Sunday, September 25. We are open Fridays, Saturdays, and Sundays from 5-9 PM”. Our third adventure, Pizza by the Pond atLoveTree Farmstead Cheese is located near Grantsburg WI. They have a website, however it has not been updated in awhile. The best way to find the most up to date information is to search them on Facebook as they have a private group that they post the dates for when they will be open for pizza. Out of all of the pizza farms we went to, this one is the hardest to find a schedule for, but again it too has delicious pizza worth the adventure of figuring out the hours of operation. We lucked out finding a time they were open and we happened to be close by visiting family. It is in a beautiful setting with a pond close by. The pizza was delicious and the one we chose had some unique flavor combinations. 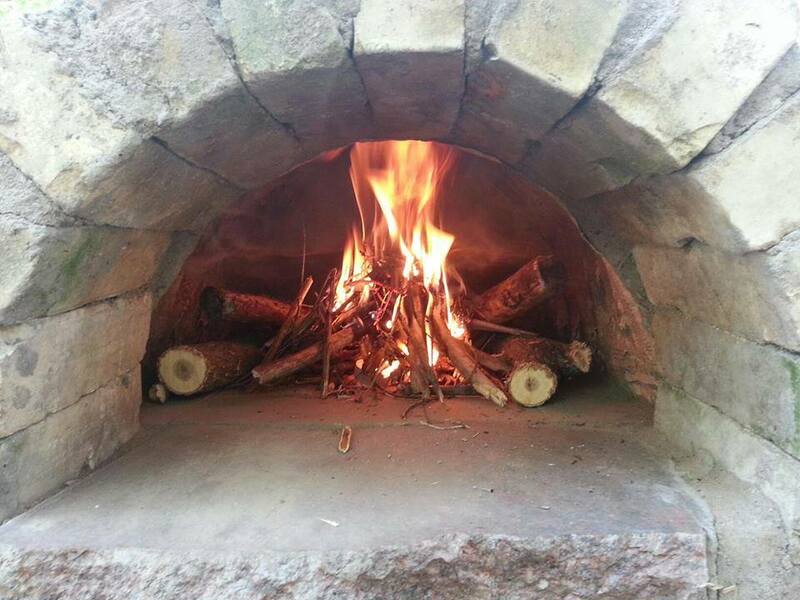 Photo taken by Mitch Thomason and found in the FB group for Pizza by the Pond at LoveTree Farmstead Cheese. 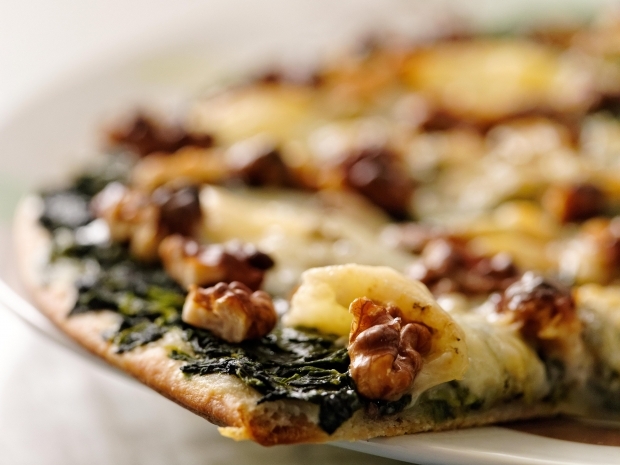 You may be familiar with The Red Barn Pizza located near Northfield. It is one of the closer locations to the twin cities that we have found. The close proximity to the twin cities is good for them, but tough when you try to go to it as it can get very busy. Last time we went, I think we waited about three hours for our pizzas. However, on a different occasion, although they were busy, we had our pizza within 15-30 minutes. So you just never know how the wait will be. Their website says they will open for the summer season in May. The most recent pizza farm we tried was the Borner Farm Project. Located just on the edge of, but pretty much in, the city limits of Prescott WI. I was so surprised by the location and where my GPS seemed to be leading us that I stopped to ask someone who was out walking if we were heading the right away. It is in a pretty residential area with signs posted about parking. This particular pizza farm had salad, drinks and even dessert for purchase when we were there. All were quite delicious. The dessert when we were there was carrot cake, which we ate while we waited for our pizza, and decided it was okay to have dessert before the meal. I loved the fact that the salad was served in glass jars. 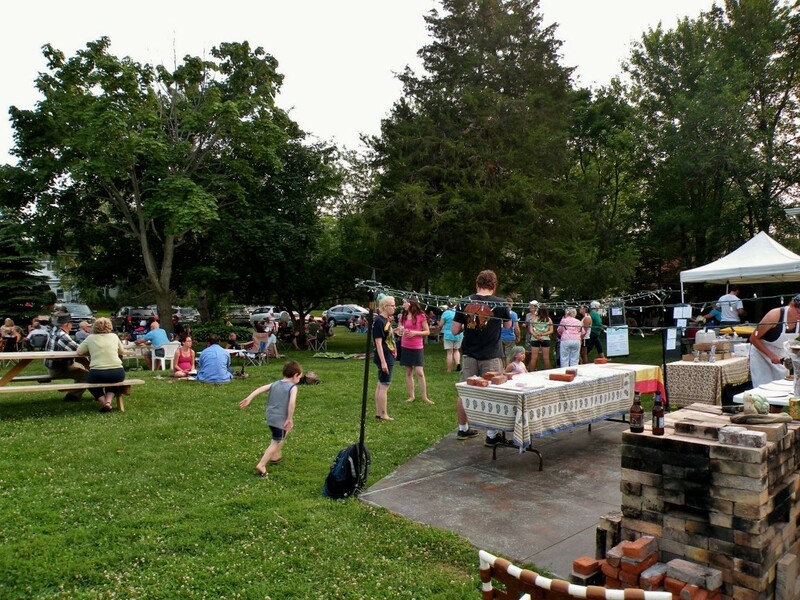 A glimpse of Pizza Night at Borner Farm Project. 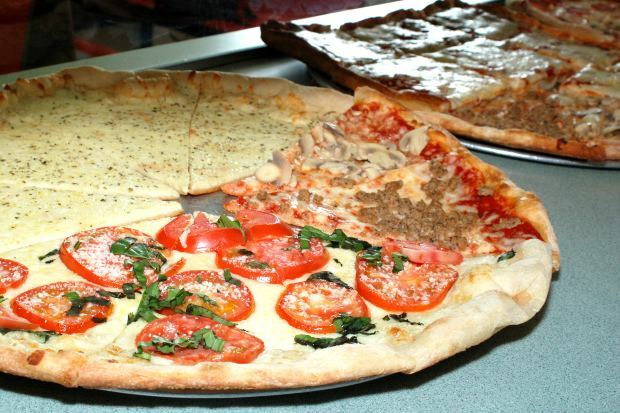 This Pizza Farm is on our bucket list and we have not been to it yet. I would still like to mention it because it looks like a great place: Pleasant Grove Pizza Farm. The website says they are opening back up in May. When I looked at the information last year it mentioned live music on their pizza nights. I hope we can make our schedule work this summer to give it a try. Next on our yet to try bucket list, a pizza farm in the southern are of MN. We almost made it last summer but a daughter with a migraine changed our plans a bit when we were near it. Dreamacres Farm is located not too far from the Iowa border with an address of Spring Valley MN. 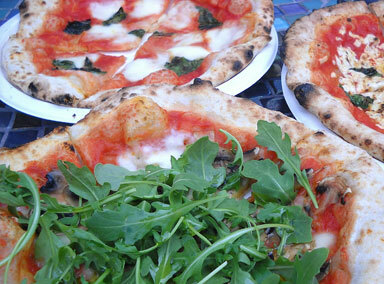 The website says it too should open for the summer season in May and they have pizza nights on Friday evenings. Last but not least, one more bucket list pizza farm that I just discovered. This bucket list is getting longer but I am optimistic for more pizza farm adventures. This pizza farm is one I just read about, and appears to be very new. Located near Clearwater, and with a fabulous name, Dancing the Land Farm appears to be mainly a CSA, I did however, see mention of it being a pizza farm on their FB page and they agreed to be added to this blog post. They said most likely a pizza schedule will include late summer or fall dates and that more information will be up on the website and FB page. Double check the times and dates of opening before making the drive to any pizza farm. Yes always double check the website or Facebook page of the pizza farm you are going to. They are small businesses with hours that vary greatly. Sometimes weather or special events might affect their plans to be open. Pack some games or things to do. The wait can be long at some of them. It depends on the amount of people and the weather which means you could be waiting for an entire afternoon or several hours. A great way to meet some random strangers is by offering to enjoy a board or lawn game together. Double check what you need to bring. Most require you to bring your own plates and drinks. Some have beverages and even salad to purchase. Most ask you to take your pizza box and garbage with you when you leave. Be prepared with wet naps and the correct clothing. It is quite likely you will be sitting outdoors and for several hours. It could even rain while you wait. Bring wet naps or a washcloth to clean up with, since you might encounter horses, chickens or goats while you wait. A blanket and or lawn chairs are also helpful as most do not offer seating other than the yard. Do not assume you can bring your dog or pets. Most do not allow animals as they have animals themselves. Plan ahead as many do not take credit cards. Some do of course, but not all so I highly suggest being prepared with checkbooks and or cash for your meal. On average you can expect to pay $20-$35 for a pizza. I like that you talked about checking the times and dates of the pizza farm before you go there. That way you know when they are open. That can help you plan a better trip and hopefully get a lot of really good pizza. I love your suggestions and have been to many of these pizza farms. 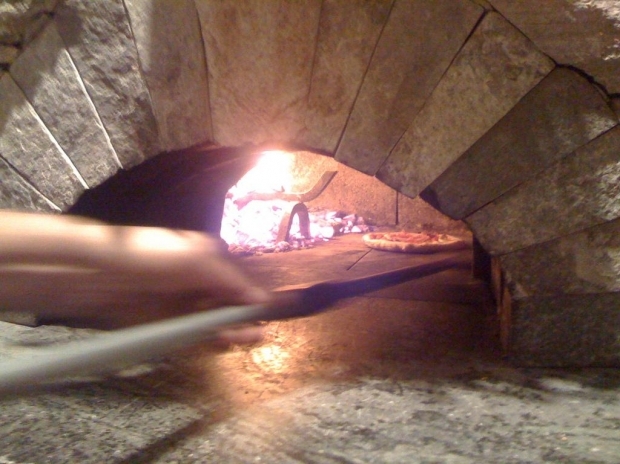 I’d add Berne Wood-Fired Pizza to your list (about 30 minutes west of Rochester, MN). In addition to great pizza, they have two bands that perform live music every Wednesday from 5-8 June, July, and August. They operate rain or shine and have indoor seating, but you provide your own plates.